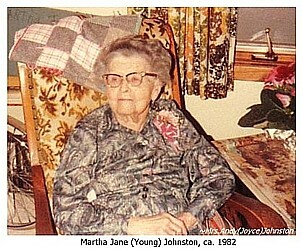 Martha Jane JOHNSTON, daughter of William H. and Nervesta (EDWARDS) YOUNG, was born near Grand River, Iowa on October 27, 1890 and died at the Clearview Home in Mount Ayr, Iowa on February 13, 1984, at the age of 93 years, three months and 15 days. Martha was born and raised on a farm in Richland Township in Decatur County, Iowa which was in part homesteaded by her great-grandfather and owned by her at the time of her death. 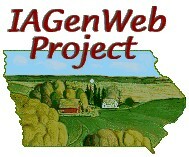 On her passing, this farm was handed down to the fifth generation of her family. On November 22, 1911, she was united in marriage to Horace A. JOHNSTON in the farm home of her parents and they were privileged to have celebrated their 67th wedding anniversary before Horace’s death in June, 1979. To this union six children were born, four of whom survive. As long as her health permitted, Martha was a hard working and devoted homemaker, mother, grandmother, neighbor, and friend. She was always quick to express her gratitude for what anyone did for her and was always willing to share what she had with others. Since November, 1977, Martha has been a resident of the Clearview Home in Mount Ayr where she received loving care by the staff and other residents. She appreciated the visits of her family, other relatives and friends. Martha was a member of the Methodist Church, Order of the Eastern Star, and Rebekahs. Preceding her in death were her parents; her sisters: Luella BRAMON, Nora GILREATH, and Carrie MENDENHALL; a brother, Fred YOUNG, an infant son and daughter [who were interred at Young Cemetery near Grand River, Decatur County, Iowa]. She is survived by four sons: Robert L. JOHNSTON of Mesa, Arizona; Richard Y. JOHNSTON of Colorado Springs, Colorado; Thomas T. JOHNSTON of Fort Madison, Iowa; and William E. JOHNSTON of Bedford, Iowa, and their wives. Also surviving are six grandchildren and two great-great-grandchildren. Also your loving sharing ways. And Cherished in the coming days. Of following your man around. Funeral services were held February 16, 1984, from Wilson-Watson Funeral Home in Mount Ayr, Iowa. Officiating was Rev. Ed KAIL. Music was provided by Mike GREENE and Mrs. Lynn RINEHART. Casket bearers were Andy JOHNSTON, Ted JOHNSTON, Mike JOHNSTON, Chet YOUNG, Percy GILREATH, and Bill MENDENHALL. Interment was in Rose Hill Cemetery at Mount Ayr, Iowa.